power adapter is pluged in downstairs and connected to a coax up to the service panel box and plugged into the power coax port. No battery on the EMTA. You have the amp with out the center power port, correct? OK, can you tell which port the modem is on? If it's on the VOIP, change it to one of the spare ports, Hopefully there are terminating resistors on the empty ports, when you take it off, put it on the now open voip port. Next step is to recheck levels. I like... Okay i will try this, this weekend. finger crossed. 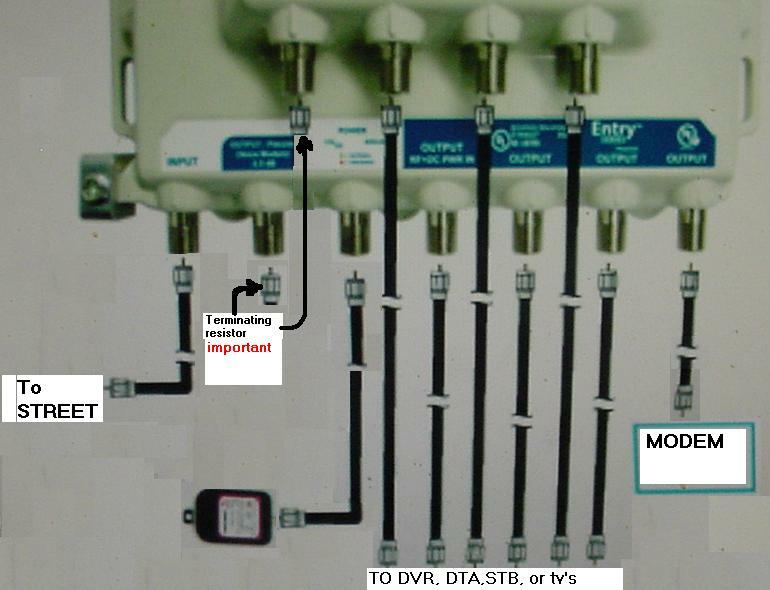 Levels need to be measured at the street tap off then at the grounding block, amp in and outputs then the modem. here are my new reading as of today, not looking much better. Where is the grounding block? is that at the tap? This channel is being interfered with by one or more of an old 800 cellular "wireline or non wireline" carriers subscriber handset. this indicates ingress from a corroded or broken shield somewhere. The grounding block is the required ground bond to your house electric/ telco ground point where cable enters the house, from either an overhead or underground drop . It is where the "To street" connection on the amplifier is connected. Is there a twc grey box out there? What's in it? I don't see any level changes from the modem line that you were going to change ports on last weekend.